We’re standing at a crossroads in caring for our planet. No one knows what will happen to our environment. It’s up to each of us to be aware, speak up and be proactive. The lives of many endangered species hang in the balance. nonprofit environmental groups and on Amazon. to buy this inspirational book on Cyber Monday, November 28th. Half of the proceeds from Amazon’s book sales on that day will go towards the nonprofit, Center For Biological Diversity, a leader in saving the world’s endangered species. Customers will also be entitled to free digital gifts. 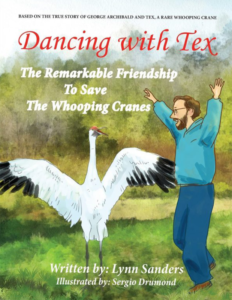 Dancing With Tex tells the true friendship story between a man and bird, and also reinforces positive values for youth. The emphasis is on having faith, belief and perseverance in your dreams. Tex finally laid a fertile egg. 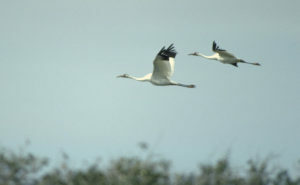 The egg finally hatched into Gee Whiz, whose numerous offspring helped save the Whooping Cranes from extinction. The event was so significant that TV host Johnny Carson interviewed Archibald as a guest on his program. occasionally. Finally, another children’s writer from a professional association contacted me to say she’d like to take my story idea and adapt it for her own children’s book. The writer informed me politely that no one can copyright an idea. crowdfunding campaign on Indiegogo to pay for illustration costs. When one illustrator was too expensive, I worked with another. The second illustrator worked on the project for about six months, but the drawings weren’t quite what I envisioned. So, it was back to the drawing boards to search for a new illustrator. Yes, there was still another obstacle to overcome. On October 25, 2015, our family encountered an unexpected and scary situation. Our son Andrew had a sudden stroke! For three days, our son lay unconscious at Evanston Hospital’s intensive care unit. When Andrew finally awoke and needed rehabilitation, my husband and I did everything we could to stay calm and be positive. Coming back from hospital visits, I’d find comfort in working with the illustrator on the book. Fortunately, Andrew recovered. Despite a year’s delay from the anticipated publishing date, Dancing With Tex finally made its debut on Amazon this past summer. You can’t imagine how joyful I felt to hold the book in my arms! My eyes filled with tears. I actually whooped with joy. Now, it’s time to spread the word and raise environmental awareness. We all must speak up to save our endangered species. belief and perseverance in making a dream come true. It’s an example of how we all can accomplish our dreams if we don’t give up. While most people don’t know the journey behind this story, I love to autograph books with the message, “Keep Your Dreams Alive!” I certainly learned to do just that.